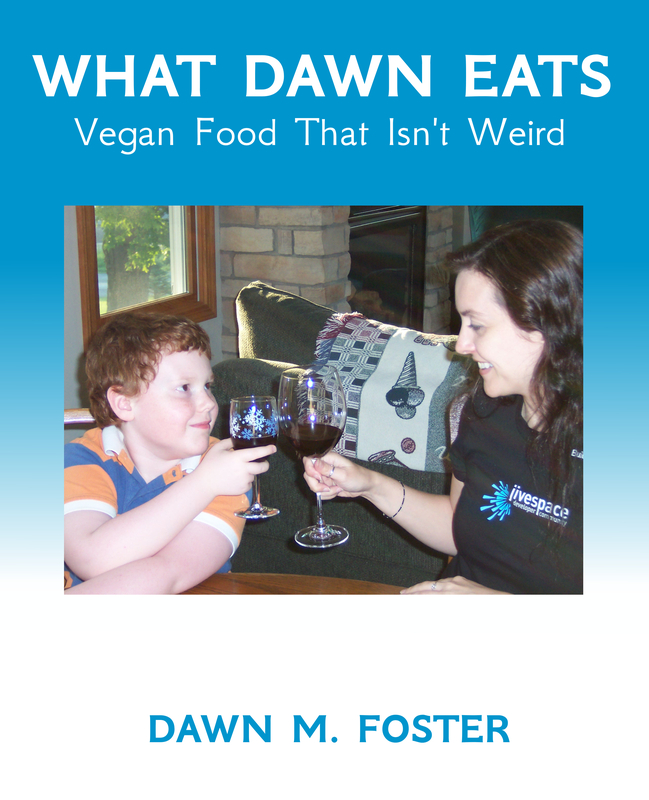 Published on May 31, 2011 in Dinner at Home and Gluten-Free. Closed Tags: mushroom, stroganoff. 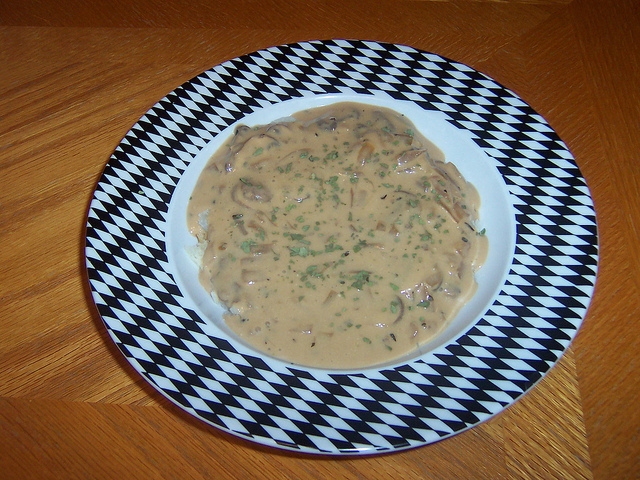 Stroganoff was one of my favorite foods as a kid, but it was a traditional beef stroganoff made with a can of cream of mushroom soup that wasn’t easily made vegan. After much experimenting and a few pretty terrible failures, I finally came up with a recipe that I love. Finding a really good commercial vegan sour cream made a world of difference in this recipe. As a bonus, it’s even fairly quick and easy to make. Makes 2 servings. 3 teaspoons cornstarch dissolved in a small amount of cold water. Heat olive oil in a large frying pan over medium heat. Add onions and sauté for 5 to 7 minutes until they are soft, translucent and starting to brown around the edges. Add mushrooms, garlic and tamari and sauté about 4 minutes or until they are soft. Reduce heat to low. Add non-dairy milk, basil, and pepper. Bring to a low simmer. Add the cornstarch mixture a little at a time stirring quickly to dissolve. Add as much cornstarch as needed to thicken the sauce. 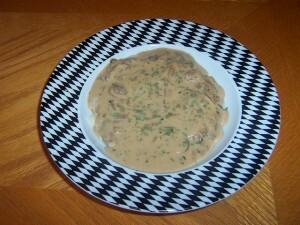 When sauce has thickened, add vegan sour cream and cook until it has heated through, but do not bring it back to a simmer. You might want to add a little more sour cream to taste. Serve over wide noodles, penne pasta or baked potatoes instead of rice. 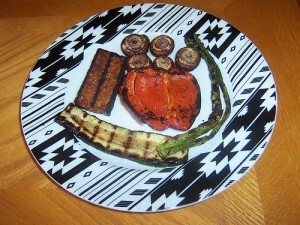 Published on May 28, 2011 in Dinner at Home. Closed Tags: cornmeal, pizza. This is the basis for the Cornmeal Pizza below. 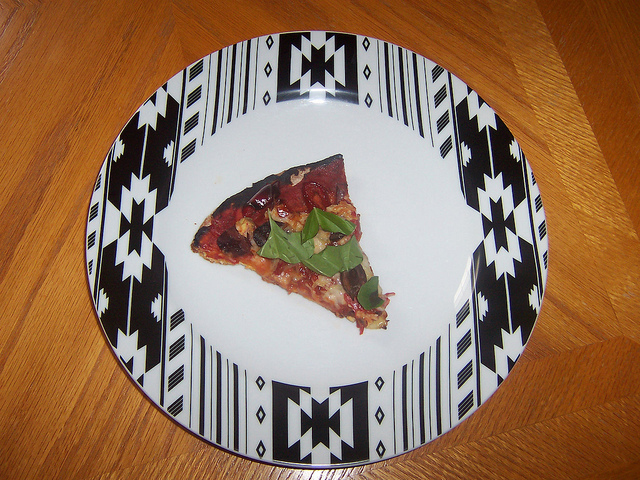 A big thank you to Mara and Raven who gave me the original recipe for this crust. Makes 2 to 4 servings. Dissolve the yeast in warm water in a medium mixing bowl. Let it sit for 3 to 5 minutes while you start gathering and measuring the other ingredients. Add half of the flour and half of the cornmeal to the warm water and yeast mixture. Mix thoroughly. Add the salt, sugar and olive oil and stir until mixed. Add the remaining flour and stir until all of the flour has been incorporated. Flour the counter and your hands. Knead for 3 minutes working in more flour as needed to prevent sticking. Dough should be smooth and elastic. Oil a second mixing bowl with a little olive oil all the way up the sides of the bowl to the top. Place the dough in the bowl turning once to coat with oil. 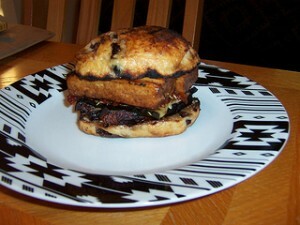 Cover with a towel and set aside to rise for an hour until doubled in size. Oil your hands and a spot on the counter. Remove the dough from the bowl and roll into a ball while squeezing all of the air out of the crust. Sit the ball of dough on the counter and let rest for 30 minutes. Press the ball flat to squeeze out the excess air before rolling into pizza shape. 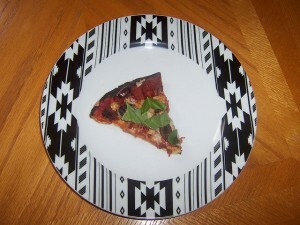 See the Cornmeal Pizza recipe below for more details on making this crust into a pizza. 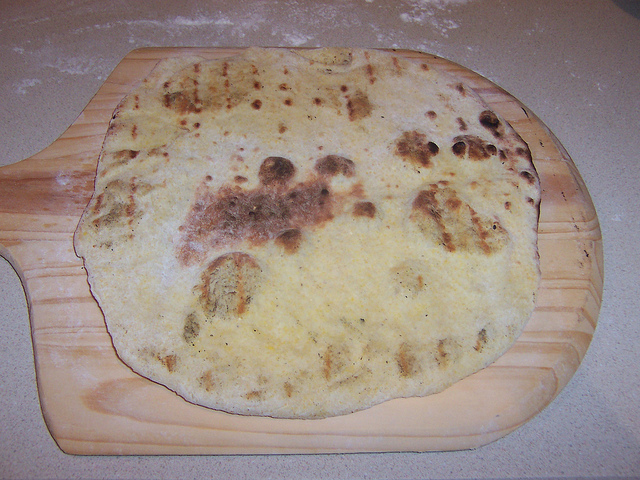 For a very thin crust, divide the dough in half and make 2 balls of dough before you let it rest for 30 minutes. Grilled Pizza Crust: Knead dough for 15 minutes – you’ll want it a little tough to stand up to grilling without falling apart. You can make a low-sodium version by reducing the salt, but the dough gets really hard to work with. Pictured above: Grilled cornmeal pizza crust. It’s gotten a little predictable with pizza every Sunday, but this is my favorite Sunday meal. It’s a great way to end the week. Makes 2 servings. Preheat the oven to 495 degrees (we also preheat our pizza stone at the same time). For a crispy crust, cook the crust by itself for a couple of minutes without any sauce or toppings (2 minutes for a very thin crust on a hot pizza stone, longer for a thicker crust). Top with sauce and veggies. Add cheese. Cook for 12 to 14 minutes at 495 degrees or until the cheese has melted. Sprinkle with torn fresh basil after you’ve cooked the pizza, but before serving. Grilled Pizza: Instead of cooking the crust for 2 minutes before adding the toppings, you can put the crust right on the grill for 1 to 2 minutes on each side. To get the crust on the grill, heavily flour a pizza peel, put the pizza on the peel, spray liberally with oil and flip in over onto the hot grill. After 1 to 2 minutes, use tongs to pull the crust back onto the peel, spray again with oil, flip and cook for another 1 to 2 minutes. Be careful not to overcook, especially for thin crust pizzas. Pesto Pizza: Replace the tomato sauce with Pesto. Use a whole recipe of the Cornmeal Pizza Crust for a thicker crust. For my non-vegan friends: this vegan cheese takes a long time to melt, so if you decide to use regular mozzarella, you’ll want to reduce the cooking time drastically. Also, other vegan cheeses melt at different temperatures, so keep a close eye on the pizza the first time you make it. 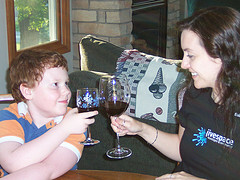 Published on May 26, 2011 in Dinner at Home. Closed Tags: beans, casserole, enchilada, mexican. All the great enchilada flavor but without the work required to roll everything into little enchiladas. This recipe calls for 2 cups baked or grilled vegetables, so I usually plan to have this the day after one of those other meals as a creative way to use the leftovers without feeling like I’m eating leftovers! Makes 6 servings. 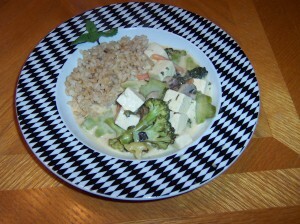 Cut the tofu into 1-inch squares. Lightly oil a large casserole dish. Spread a couple of spoonfuls of enchilada sauce across the bottom of the dish. 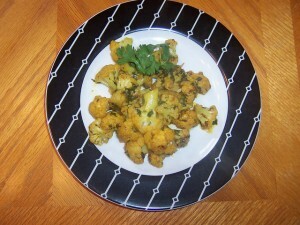 Add remaining casserole ingredients, except for half of the cilantro, and stir to combine. Bake uncovered in the oven for 30 to 40 minutes or until hot and bubbly. Sprinkle the remaining 1/4 cup cilantro over the top. 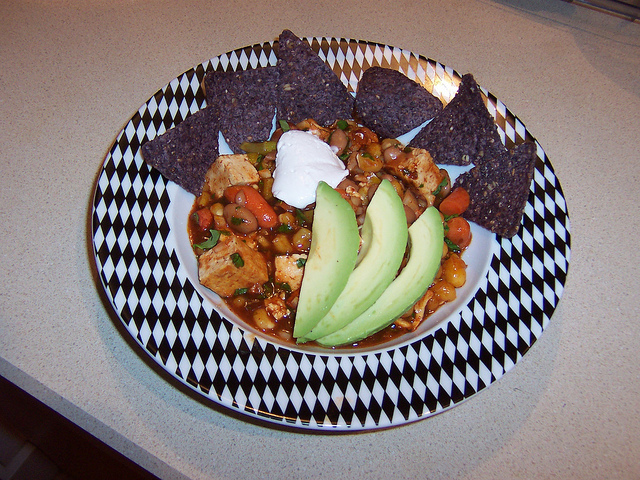 Serve in a bowl with tortilla chips, avocado slices and vegan sour cream. Add a couple layers of corn tortillas, which makes it kind of like an enchilada lasagna. Serve with corn tortillas and use the enchilada casserole as filling to wrap like burritos. Top with vegan cheese before baking. Add fresh or sun dried tomatoes. Experiment with other kinds of beans or vegetables. 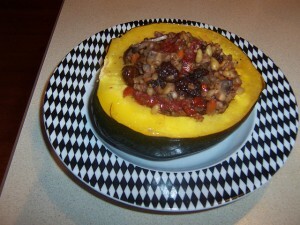 Published on May 19, 2011 in Dinner at Home and Gluten-Free. 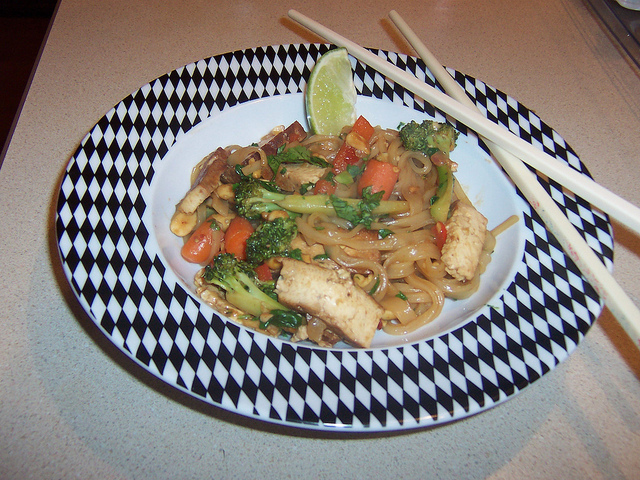 Closed Tags: noodles, pad thai, thai, tofu. For when you just want a big plate of Thai noodles. Vegan Black Metal Chef techniques are optional, but encouraged. 🙂 Makes 4 servings. Combine the tamari, palm sugar, chili paste and rice vinegar in a small bowl and set aside. Place the rice stick noodles in a mixing bowl and cover with hot water. Set aside while you prepare the remaining ingredients. Once the other ingredients are measured out into separate bowls, drain the water from the noodles and set them aside. The noodles should be soft and ready to eat. If not, cover with more hot water or boil on top of the stove for a minute or two like you would any other pasta. Drizzle the noodles with an extra tablespoon of tamari if you want to give the noodles a little more flavor. 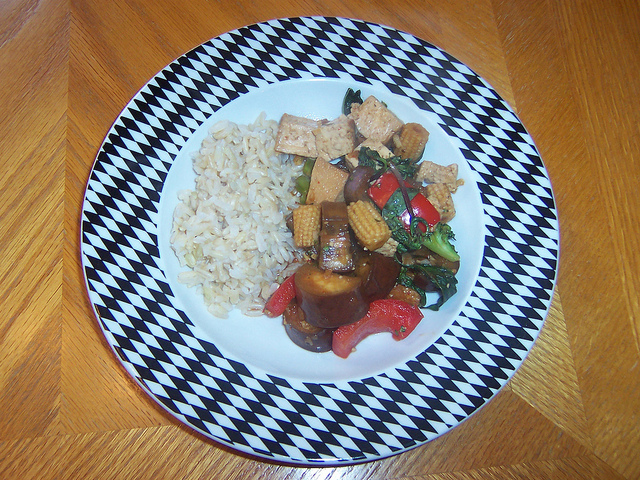 Cut the tofu into 1/2-inch wide strips, similar to French fries. Press the tamarind paste and hot water through a fine mesh strainer, pushing as much of the pulp through the strainer as possible and add to the sauce. Discard any remaining pulp or bits that were too big to strain. Add peanut oil to the pan and heat over high. Add shallots and cook for about a minute. Add the garlic and cook for 10 to 15 seconds. 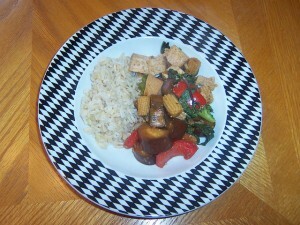 Add veggies and stir-fry with 1/4 of the sauce for 2 to 3 minutes or until almost done. Add the noodles and stir-fry for another 2 to 3 minutes until the noodles taste done. Add the tofu and half the peanuts. Add the sauce slowly as needed (you might not want all of the sauce). Toss everything until heated through, but no longer than 1 to 2 minutes total. Sprinkle with the cilantro and remaining peanuts. Toss to coat. Serve immediately with lime wedges. Replace rice noodles with 2 zucchinis (spiral sliced) for a slightly healthier veggie noodle version. Dunk the zucchini strings in hot water for a minute or until warmed. Published on May 17, 2011 in Dinner at Home and Gluten-Free. Closed Tags: asian, basil, eggplant, thai, tofu. A delicious way to use an Asian eggplant, and it’s a nice change from the various Thai curries that we usually make for dinner. Makes 4 servings. Heat oil in a wok or large pan over medium heat. Sauté shallots for 2 to 4 minutes or until they turn translucent. Increase heat to high and add veggies, garlic and kaffir lime leaves. Stir-fry veggies for 1 to 2 minutes. Add basil, tofu and sauce. Stir-fry another 2 to 4 minutes until done. If you can’t find Thai Basil, use 10 sprigs of regular basil, but remove the stems and use the whole leaves. Experiment with some other vegetables, like cauliflower and zucchini.